Qualcomm has recently launched a new augmented reality (AR) platform for Google Android OS based phones. The company has released the commercial v1.0 build of its AR platform, which enables Android app developers to integrate AR into their software. Qualcomm says that the AR platform will work on any Android 2.1+ device, but suggests that performance will be better on devices that use Snapdragon chipsets. Augmented reality is the superimposition of location-based content over live images viewed through mobile cameras. With hardware such as accelerometers, cameras, compasses and GPS now available in most smartphones, it will be easier to add information from these functions onto a real-time video or image. The technology was earlier used for military purposes and now will be available for our daily use. With augmented reality, the mobile user's experience will definitely become much bigger and better. Moreover, many developers are now coming up with relevant applications and there will be lots of interesting apps to look out for in the near future. Jay Wright, Qualcomm's senior director of business development said in a media release, "Qualcomm has a long history of providing advanced technologies that drive innovation and opportunity for the mobile ecosystem. We continue the tradition by making leading AR technology widely available to developers for commercial use. With more than 6,000 registered developers, we look forward to a new generation of AR applications available in the Android Market and other application stores." Augmented reality helps users get information about their surroundings, enhances their social networking experience and also comes in handy as a marketing and translation tool. But the highlight will no doubt be the gaming experience. With the help of AR, you will be able to merge virtual reality games with actual reality. One such commercial gaming application is coming soon. Qualcomm and BigPlayAR have recently collaborated with Dallas Mavericks to introduce the first commercial application using Qualcomm's platform. 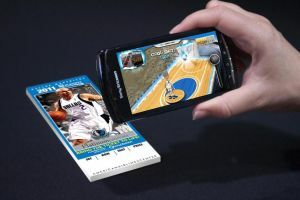 Mavs AR, a game developed by BigPlayAR, has enabled fans attending the Mavs playoff games at American Airlines Center to point their smartphones running the Mavs AR application at their tickets and play a virtual game of basketball game in the palm of their hands. "We are thrilled with Mavs AR â€“ it has really added a new layer of fun and interaction to the Mavs fan experience," said Mavs owner Mark Cuban. "Based on the game's success, we expect to use AR for future fan promotions. Qualcomm's AR platform has proved to be a powerful platform for creating these types of 3D experiences." Dutch company Layar, another provider of AR for mobiles, recently launched the world's first AR content store which introduces a new revenue stream. The Layar reality browser is available for download at the Android Market, the Apple App Store and the Nokia Ovi Store. The Qualcomm AR Platform is currently available for download here.